UK Football's Blue-White game set for 6 p.m. Friday, April 12. 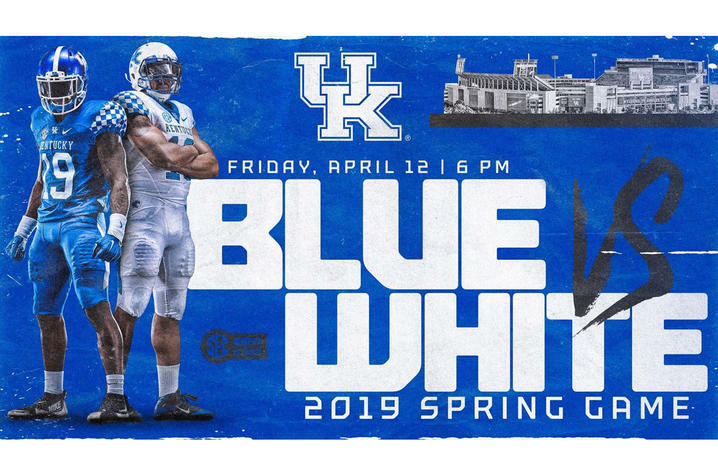 LEXINGTON, KY. (April 11, 2019) — Kentucky Football’s annual Blue-White game will kick off 6 p.m. Friday, April 12, meaning some University of Kentucky students will need to relocate their vehicles in preparation for the game. In addition, UK employees should be prepared for an increase in traffic on and around campus that afternoon. College View West Lot (adjacent to the UK Motorpool). Students will be able to relocate to other parking lots and structures on campus, with the exception of UK HealthCare garages and reserved and residential parking areas. The South Limestone Garage (PS #5) and the Rose Street Garage (PS #2) will be available for relocation purposes. Employees who park in the Orange Lot are not being asked to relocate. In addition, UK Transportation Services is adding an extra bus to the Orange Route Friday afternoon to better accommodate UK HealthCare employees who may be impacted by increased traffic in that area. The heaviest impact is expected to be from 4:30 to 6 p.m. and immediately following the game, around 8 to 9 p.m.